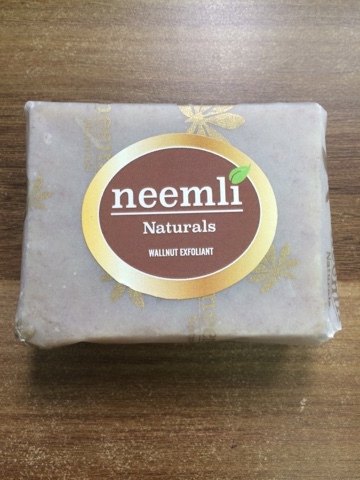 COMING TO THE BASIC DETAILS FIRST, IT IS A 100% NATURAL HANDMADE SOAP AND IS FREE FROM CHEMICALS. AREN'T THE INGREDIENTS ENOUGH REASON TO LOVE THIS PRODUCT:)!!!!!! NOW COMING TO MY EXPERIENCE WITH THE PRODUCT I LOVE HOW EFFECTIVE THE PRODUCT IS. IT IS VERY COMFORTABLE TO SCRUB YOUR BODY WITH IT SINCE IT IS IN A SOAP SHAPE. IT NOT ONLY EXFOLIATES THE SKIN BUT ALSO MOISTURISES IT DUE TO THE PRESENCE OF ABUNDANT OILS IN IT..